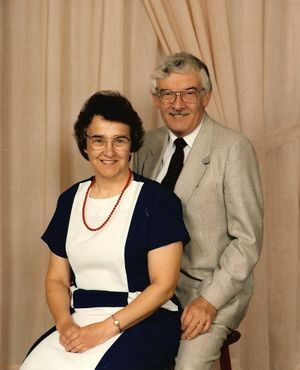 Ralph Arthur Lebold: minister, conference leader and college president, was born 12 May 1934 in New Hamburg, Ontario, Canada to Elmer Lebold (30 March 1908-27 August 1964) and Katie Leis Lebold (19 March 1911-17 January 1995). He was the second child and oldest son in a family of two daughters and four sons. He married Eileen Erb, daughter of Michael B. Erb (19 September 1901-20 October 1987) and Mary Bast Erb (10 April 1901-24 November 1989) on 27 August 1955. They had three children: Connie, Marvin and Cynthia. Ralph Lebold died 31 October 2017, 26 years after being diagnosed with chronic myeloid leukemia. Ralph Lebold lived in the town of New Hamburg until the fifth grade, when the family moved to a farm on the Nith River north of Baden, Ontario. He left school after grade eight and worked on the farm. At age 13 he was baptized into the Steinmann Amish Mennonite Church. He attended the Wellesley Winter Bible School for four years, and Ontario Mennonite Bible School for three years, graduating from the latter in 1953. Ralph continued in the pre-university course at Ontario Mennonite Bible Institute in 1953/54, and enrolled at Eastern Mennonite College in 1954, where he received his BA in 1958. The family moved to Goshen, Indiana in 1959 where Ralph studied at Goshen Biblical Seminary, where he received a BD degree in 1961. He began pastoring the King Street Mennonite Church in London, Ontario that fall. In 1963 the congregation moved to a new location in northeast London and became known as Valleyview Mennonite Church. In 1962 he was a founder of Hidden Acres Mennonite Camp, located near the village of Shakespeare. In 1966-1968 the Lebold family took a leave and moved to Pennsylvania where he studied at Crozer Theological Seminary for an MTh in Pastoral Care and Counselling (1968). He was led to seek a new approach to pastoral training because of the death by suicide of a young man who had rented a room in the Lebold home. After returning to Valleyview, Ralph launched a Clinical Pastoral Education (CPE) program in association with the Associated (now Anabaptist) Mennonite Biblical Seminary. That first fall three seminary students spent a year at Valleyview working both in the congregation and at the London Psychiatric Hospital where Ralph was a teaching chaplain, while continuing to serve half-time at Valleyview. In 1974 Ralph Lebold became the first conference minister for the Mennonite Conference of Ontario and the Western Ontario Mennonite Conference. During these years Ralph encouraged women to pursue pastoral leadership. In 1976 he suggested that Doris Weber be commissioned for pastoral service alongside her ordained husband, Rod. By 1978 this status was changed to ordination. Other women in leadership soon followed. In 1978 Ralph Lebold began work in the new DMin program at the Toronto School of Theology; he received his degree in 1980 with a research project on “The evaluation of the pastoral leader in the context of the congregation.” This led to a later book, Learning and growing in ministry: a handbook for congregational leaders published by the Mennonite Publishing House in 1986. Ralph served in the conference minister role until 1980. He was called in 1979 to consider becoming president at Conrad Grebel College. He was familiar with some of the issues at the College, having been called to help work at an internal conflict in 1977, and had been involved in the School of Adult Studies based at the college. He accepted the position and served as president from 1979 to 1989, overlapping with the conference minister role at the beginning of the first year. Ralph Lebold’s 10 years as president at Conrad Grebel College were good years for the College. In 1988 the college received a new charter, permitting it to grant a range of degrees in Religious Studies, leading to the beginning of the Master of Theological Studies (MTS) program at the College. During these years, he also helped to found Shalom Counselling Services in late 1982 and chaired the Shalom board until 1993. In the larger Mennonite Church (MC) denomination he served as moderator-elect of the General Assembly and General Board from 1985-1987, and as moderator from 1987 to 1989. After leaving Conrad Grebel in 1989, Ralph Lebold took on a joint assignment with the Associated Mennonite Biblical Seminary and the new Mennonite Conference (now Church) of Eastern Canada (MCEC) in Pastoral Leadership Training, the part of his vocation that gave him the most energy. He continued in this work until retirement in 1997. In 1991 Ralph was diagnosed with chronic myeloid leukemia, a disease with a prognosis of up to three or four years. Although his health went through cycles, new treatments extended his life 26 years. During most of those years he continued to make strong contributions to the local conference, to Waterloo North Mennonite Church, where he was a charter member, and as a mentor to many younger leaders in the church. At his funeral a church leader described Ralph Lebold as an entrepreneur within the church–not about making a lot of money, but in helping to innovate new programs and approaches to ministry that had a profound influence on the Mennonite Church throughout North America. “Celebrating the life of Ralph Arthur Lebold.” Funeral bulletin. 4 November 2017. Lebold, Ralph. Strange and wonderful paths: the memoirs of Ralph Lebold. Kitchener, Ont. : Pandora Press, 2006. Lebold, Ralph. “Strange and wonderful paths: looking back on 50 years of ministry.” Canadian Mennonite 15, no. 18 (14 September 2011). Web. https://www.canadianmennonite.org/articles/strange-and-wonderful-paths. “Lebold, Ralph Arthur.” Waterloo Region Record. (1 November 2017): B7. Web. 23 October 2018. http://www.lifenews.ca/announcement/7765758-lebold-ralph-arthur. Rogalsky, Dave. “A leader of leaders: Ralph Lebold, May 12, 1934-Oct. 31, 2017.” Canadian Mennonite 21, no. 22 (20 November 2017): 13. Web. https://www.canadianmennonite.org/stories/leader-leaders. Steiner, Sam. “Conrad Grebel University College Presidents — Ralph A. Lebold.” In Search of Promised Lands (blog). 13 November 2017. Web. https://ontariomennonitehistory.org/2017/11/13/conrad-grebel-university-college-presidents-ralph-a-lebold/. Steiner, Sam. "Lebold, Ralph Arthur (1934-2017)." Global Anabaptist Mennonite Encyclopedia Online. October 2018. Web. 21 Apr 2019. http://gameo.org/index.php?title=Lebold,_Ralph_Arthur_(1934-2017)&oldid=162312. Steiner, Sam. (October 2018). Lebold, Ralph Arthur (1934-2017). Global Anabaptist Mennonite Encyclopedia Online. Retrieved 21 April 2019, from http://gameo.org/index.php?title=Lebold,_Ralph_Arthur_(1934-2017)&oldid=162312. This page was last modified on 31 October 2018, at 22:42.